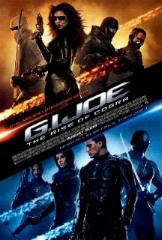 Following one of the most expected moments of a G.I.Joe "a real american hero" fan´s life, we decided to make this blog public on this great 7th of August, 2009. Official "Rise Of Cobra" premiere day. Although already screened and reviewed by many in as much countries, this is the long awaited for day! And for us, concerning this blog, is also a great day. Hopefully, lots of new friendships, new trades, new ways of seeing old toys will happen here! Enjoy, and be part of this. Yo Joe! PS: We couldn´t wait any longer, and being portuguese and knowing we´d have to wait 6 more days for the premiere... we´re leaving today... destination... France! See you in 4 days!